In 2015, marketing leaders who have embraced the mobile mind shift will accelerate spending to create an insurmountable gap between themselves and the laggards who view mobile as just another channel. Mobile-shifted marketers will transform their brands’ customer experiences and drive business outcomes by taking a sophisticated approach that focuses on how to activate mobile experiences. In 2015, we will also see marketing leaders who look at mobile as just another channel struggle to deliver results, differentiate their brands, and justify the budgets they need to stay competitive. 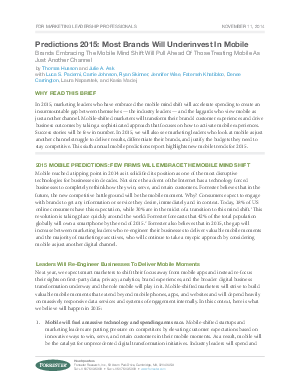 This paper explains the new mobile trends for 2015 and how Brands embracing the mobile mind shift will pull Ahead of those treating mobile as just another channel.